The Supreme Court today issued notice to Gujarat government on a fresh petition filed by Patel quota agitation leader Hardik Patel against High Court order refusing to quash sedition charge against him for allegedly attacking places like police stations in the state. Justices J S Khehar and R F Nariman posted the appeal for hearing on January 5 with another plea of pending plea against another High Court order. “At best the case is of intemperate language and the provisions invoked against him does not fit in ..this is a totally different case. From where does sedition come I don’t understand”, senior lawyer appearing for him, Kapil Sibal, told the bench. Attorney General Mukul Rohatgi who appeared for the Gujarat government however stiffly opposed Patel’s petition saying judiciary, police, police stations and politicians were targeted across the state and it cannot be said that there was no criminal action. On November 6 Patel had suffered a major setback when the Supreme Court refused him bail and asked the Gujarat police to complete probe in a sedition case against him within 45 days. The evidence with the police is a video clip in which Patel is allegedly inciting a fellow activist to 'beat up or kill' Gujarat police men instead of committing suicide. Sibal referred to the content of the FIR lodged against Hardik Patel on October 18 under various IPC provisions relating to the offence of sedition, abetment of an offence, spreading rumour or false statement and criminal intimidation. Sibal further said that some of the charges have been quashed by the Gujarat High Court and the charges under sections 124A (sedition), 115 (abetment of an offence) of IPC have not been done away with. Sibal had earlier argued “We are not challenging the vires of the penal law. This is a valid law. 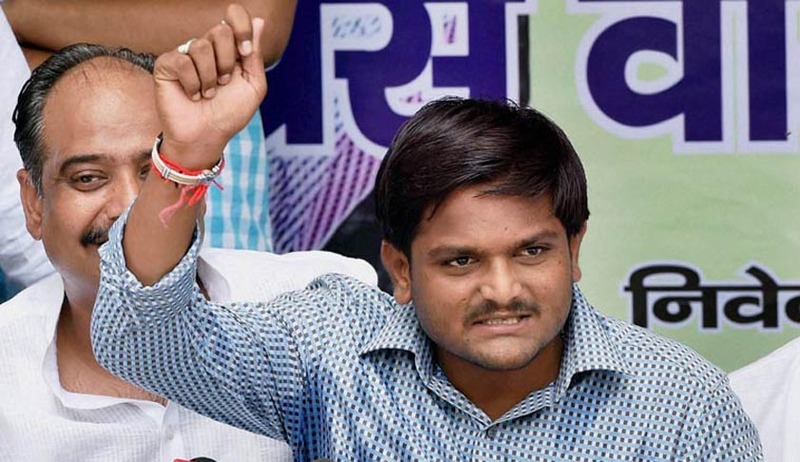 The question is what is the test to be applied in the offence of sedition”, he said and referred to the factual aspects of the case when Hardik had visited the residence of a pro-quota activist on October 3.